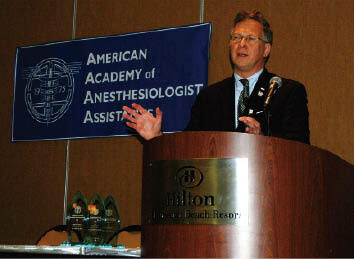 The AAAA 33rd Annual Meeting was held at the Hilton Clearwater Beach, FL, on April 18-22, 2009. The AAAA strongly believes that the key to any successful educational meeting should be the quality of the speakers and the topics they present. I would like to take this opportunity to publicly thank all of our speakers for volunteering their time to educate our students and practicing AAs. They were truly the backbone of our Annual Meeting. at the 2009 AAAA meeting in Clearwater Beach, FL. Shane Angus, AA-C, and Joseph Mader, AA-C, started the conference on Saturday with a great lecture on clinical education, and followed it up with a Clinical Instructor Workshop the next day. Dr. Gerald Maccioli, ASA director for North Carolina and chair of the ASA Section on Education and Research, gave us an eye-opening look at what it is like to be a part of a malpractice lawsuit. We were honored to hear from Dr. Alexander Hannenberg, ASA president-elect, with an update on the state of the ASA as well as how Washington, DC can affect all of us. 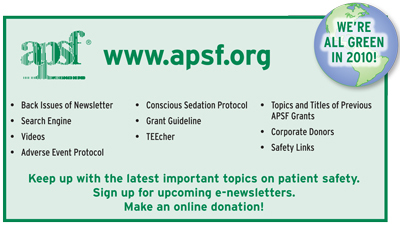 Dr. Robert Morell, member of the APSF Executive Board and newsletter editor, reminded us of how important it is to properly position our patients in order to avoid injuries. Dr. Ann Bailey, professor of Anesthesiology and Pediatrics at UNC Chapel Hill, gave us quite possibly the best 2 pediatric lectures we have had at our annual meeting in years. Dr. Tricia Meyer, director of Pharmacy and assistant director of Anesthesiology at the Scott and White Healthcare System, reviewed PONV and discussed medication safety. Dr. Roy Soto, director of Anesthesiology Education at Beaumont Hospital, spoke to us about trauma and alpha-2 agonists. Michael Nichols, AA-C, AAAA director and past president, discussed the use of medical simulators in the training of AAs and its possible place in AA certification. Our Annual Student Jeopardy event was moderated by Dr. Joel Zivot, medical director of the Cardiac ICU at St. Boniface General Hospital and the Winnipeg Regional Health Authority in Winnipeg, Canada. This event is always a huge success and a wonderful learning tool for our student members. Dr. Zivot also gave us an excellent lecture on pulmonary artery catheters and new cardiac output monitoring technologies. This year, we were very fortunate to have Dr. Tong Gan, vice chair of Anesthesiology at the Duke University Medical Center and president of the Society for Ambulatory Anesthesia. His lectures on some of the drugs we might see one day in anesthesia and on fluid management were very insightful. We also heard from Dr. Matthew Zeleznik, anesthesiologist at St. Joseph’s Hospital in Atlanta, GA, about the new development of using Intralipid in the treatment of local anesthetic toxicity. Claire Chandler, AA-C, gave an update on 2 very important organizations involved with AAs, the Commission on Accreditation of Allied Health Education (CAAHEP) and the Accreditation Review Committee on Education for the Anesthesiologist Assistant (ARC-AA). We were extremely fortunate to have Dr. John Ellis from the University of Pennsylvania School of Medicine and vice president of the Society of Cardiovascular Anesthesiologists Foundation wrap up our 2009 Annual Conference with his lectures about preoperative cardiac evaluation and myocardial ischemia. In addition to all the wonderful speakers and educational lectures, we had an excellent group of sponsors and exhibitors for the weekend. On the social side, our Community Initiatives Committee arranged the 2nd Annual Blood Drive, which was hugely successful, and the 2nd Annual Golf Scramble with proceeds going to The Children’s Cancer Center in Tampa, FL. We look forward to our 34th Annual Conference at the Hyatt Regency in Savannah, GA, April 10-14, 2010. Chris Caldwell, AA-C, was chair of the AAAA Annual Meeting.